JESSICA WISDOM, of Battle Ground, stands next to her prize-winning pony, North Forks Cardi, a 13-year-old Welsh Cob stallion. Wisdom and Cardi are the only pony-rider combo in the highly competitive world of dressage. EQUESTRIAN JESSICA WISDOM rides her Welsh Cob stallion, North Forks Cardi, at the acclaimed Dressage at Devon competition in Southeastern Pennsylvania. The event draws Olympic-level riders, horses, trainers and judges from around the world. BATTLE GROUND RESIDENT Jessica Wisdom readies Sienna, a 3-year-old Hanoverian horse, for a lesson at Emerald Valley Stables in Ridgefield, where Wisdom trains horses and gives riding lessons. Wisdom, of Battle Ground, and her pony Cardi (not pictured here), recently won first-place in the Grand Prix Freestyle category at the prestigious U.S. Dressage Finals in Lexington, KY. In the days preceding this year’s U.S. Dressage Finals, a horse riding competition that showcases the most talented horses and riders in the country at the renowned Kentucky Horse Park in Lexington, Ky., the horse media world was already buzzing around Battle Ground equestrian Jessica Wisdom and her pony, North Forks Cardi. Could the Pacific Northwest rider and her tiny horse beat the tall, warmblood horses that reigned supreme in the competitive world of dressage? Wisdom, 37, a Battle Ground horse trainer, teacher and competitive rider, knew that they could. 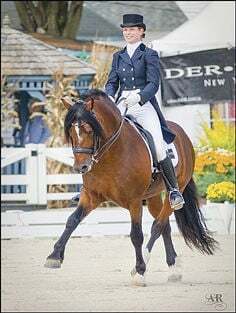 After all, she and her Welsh Cob pony had already had a pretty spectacular year, taking first-place in the freestyle category at prestigious international horse competitions and earning their spot in the national dressage competition. Still, Wisdom realized that she and Cardi were breaking new ground. In fact, they are the only pony-rider combo currently competing at the Grand Prix level of dressage competition. In articles written just before the national competition and directly after, journalists marveled at the fact that a pony had performed so well at the U.S. Dressage Finals, taking first-place in the Open Grand Prix Freestyle division and placing third overall in the Grand Prix Open Championship. The fact that Cardi won the national freestyle event, which combines technical skills with the more artistic aspects of dressage, didn’t surprise Wisdom. After all, Cardi has always loved the freestyle event and the loud music that accompanies it. Wisdom fell in love with horses and with riding, but she never planned to be a professional trainer or dressage competitor. In fact, her original life plans didn’t even involve the land. Flash forward 20 years and Wisdom certainly isn’t regretting her change in life plans. Today she is an in-demand horse trainer and instructor who has won multiple gold medals in Olympic-caliber competitions. Since making a name for himself on the Grand Prix competition circuit, Wisdom’s pony, Cardi, also has been in high demand with breeders. Wisdom has seven of Cardi’s offspring at the Emerald Valley Stables in Ridgefield and says breeders are smitten with her “rock star” pony. Not only are Wisdom and Cardi making a name for rider-pony combos, they’re also highlighting dressage competitors from the Pacific Northwest, a region Wisdom calls “up and coming” in the horse training and competition world. To find out more about Wisdom or Team Cardi, the supporters who have helped Cardi make a name for himself on the international and national dressage competition circuits, visit www.eqequestrian.com. Wisdom trains and teaches at Emerald Valley Stables, at 1613 NE 259th St., Ridgefield. To contact Wisdom regarding horse training or riding lessons, email her at eqequestrian@cs.com or call (253) 230-9764.